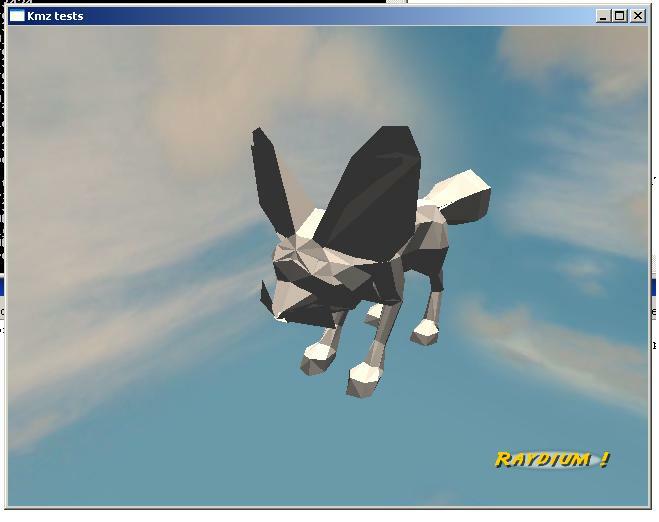 Raydium 3D Game Engine • View topic - Google Sketchup / Collada / Kmz and Raydium. Google Sketchup / Collada / Kmz and Raydium. Post subject: Google Sketchup / Collada / Kmz and Raydium. All is done with a php script. You need only a kmz file. Google sketchup can generate (export) such kmz files. Run php script from embended application. (1) kmz is uncompressed. (2) Texture are "automaticaly" converted to tga (need to add gd2 extension to php (see php.ini)) (3) .tri file is generated. BUT due to a probably misuse of php script become quite slow for bigs objects. If a php specialist have an idea ? BE REALLY CARREFULL: google sketchup file are very heavy, lot's of vertex sometime simple objects. Needed to be used with attention, Sofa resulting .tri file is for example 27Mbyte file (cocorobrix is less than 3Mbyte!!!!!). File comment: php script and test program. Switch mode with right mouse button. Post subject: Re: Google Sketchup / Collada / Kmz and Raydium. A fennec ! \o/ Sweeeeet ! About speed, the only thing I can say is that PHP isn't as good about memory management as a compiled language ... While working on DirectX-to-tri PHP script, I've seen incredible things ... For instance, on the first version of the script, I was using global variables and references (&), to simplify work for PHP (no need to copy parameter for functions). Even with this, the script was damn slow. Almost by error, I've moved to regular (copy) parameters for functions, and the script suddenly increased its speed by 10x ! The only thing I've learned then is not that you should use parameter by copy, but that PHP is simply out of any logic when it comes to (big) memory management. This new version of the script is now quite as faster as light. Using Xpath can speed up things a lot. Waiting for validation before commiting. Kmz is a zip file with model as collada file and texture as image(jpg/png ...) in at least two different folders. I think that adding test_kmz.c to "normal" raydium dir is a way to handle sketchup files. Leaving his name (test_kmz) is explicit no ? contrib dir will break all relative path for building app quite easily, except for me I'll have to maintain a new project file and others things like this. About official support, i think that the biggest part about collada / kmz support is done now. There are probably lot's of things to add, but overall is here i hope so. - http://sketchup.google.com seems to provide mostly "skp" files. How should I do ? - we see this as a "proof-of-concept", and plance it in the contrib dir. - we upgrade this as a tool, polishing it and thinking about how the user will see it and use it. What about this new version ??? try to respect all guideline. Is ti ok ? Same story when I try to open a non existing file, it leads to a crash. http://sketchup.google.com seems to provide mostly "skp" files. How should I do ? What is the link between these two formats ? - filename tests, one small correction in php. And error handling in raydium application. I hope it's enough. -convert_iso_xml: it's really ennoying. If the xml header of the file, is type of utf8 it is not parsed correctly by xpath. I don't know why. I've searched why, and i still don't know. I propose this small "hack" it allow script to work. I hope next version of php handle this correctly, or some one help me to understand why. My sketchup generated kmz file are ok, but getting some file from internet raise the problem. - skp file are sketchup files. kmz file can be generated by skectchup, in file->export. Last but not least, this script is a collada parser. And collada file format is quite well supported now. So even if it is not used for sketchup it can be usefull for collada translation. Here is the last version. Can you make some tests ... and if it's ok i'll like to add thoses files to raydium "official" directory. File comment: october version of raydium application and php script to convert sketchup/collada file to raydium .tri file format. - Test for gd is wrong (generates an syntax error when extension is not present) . And we should perhaps include gd in our PHP distribution ? "in Sketchup export file in .kmz format" -> ? "Are now in your writable directory" -> "are now created in your writable directory" ? remove obvious states: "Enter name and click Load" and "You can specify an output mesh scale", the application is self explaining on this. I'll also try all this with Linux ASAP. Apart from these points, it looks close to a final state ! Now just select your kmz file in the combo menu. Hope your kmz file and this program are in same directory. To create kmz file in sketchup goto file-> export -> 3d model -> google earth file format. About my message i think that your note is a bit ironic no ? Just say what you think it must contain, i'll follow the guideline. This is still a working version. File comment: kmz_2_tri with direct file selection. Just a quick note on this subject (or I will forget it ) after talking with ouille on this point: we need to work a little bit on error checking: my kmz file is not correct, that why I had all these error lines I talk about in my last post, and the script should report this issue. Long story short: Blender is THE tool for Raydium. You'll have hard times to get anything modeled/imported into Raydium without it. You should really try to fix your Blender issues on your computer ! Please post your file. I'll have a look.